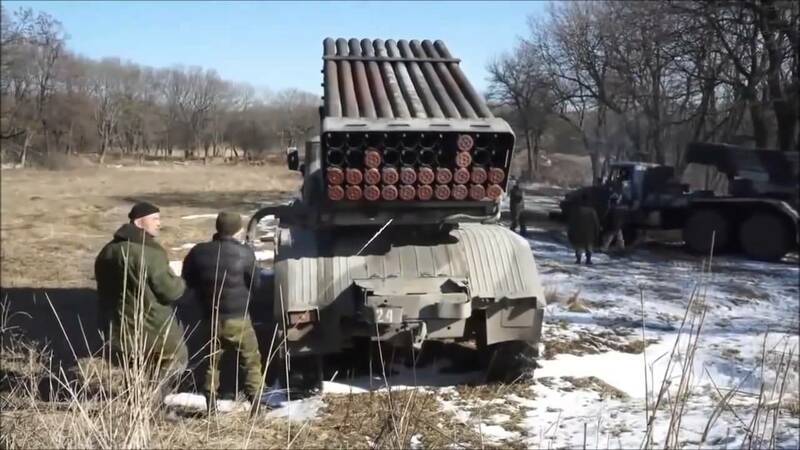 KIEV, Ukraine -- The Ukrainian government on Thursday accused Russian-backed rebels of using large-caliber weapons despite a cease-fire in eastern Ukraine that required both sides to pull back those arms. Fighting in Ukraine's industrial heartland has intensified in the past weeks as peace talks have reached a stalemate. The separatists deployed a Grad multiple-missile launcher against government troops early Thursday outside the rebel stronghold of Donetsk, Ukraine's eastern operation said in a statement. Since the truce was signed in February 2015, there have hardly been any reports of the use of Grads. The press office said the Grad attack, the alleged video of which they posted on their Facebook page, came along with over 60 cease-fire violations along the front line. More than 9,200 people have been killed since fighting broke out in April 2014 when Russian-backed separatists took over parts of Ukraine's east following Russia's annexation of the Crimean Peninsula. The rebel mouthpiece Donetsk News Agency accused government forces of shelling Donetsk suburbs on Thursday, killing one fighter, burning down a house and damaging many more. The fighting now threatens crucial infrastructure. The company operating the Donetsk water treatment plant said Thursday they had to halt the operations and evacuate employees because of nearby fighting. A new U.N. report says civilian casualties have declined in eastern Ukraine in recent months. It said 21 people were killed and 57 injured from Nov. 16 to Feb. 15. Rights monitors, however, are warning of documented reports that Ukrainian law enforcement officials were carrying out enforced disappearances and torture "with impunity" in that same period.